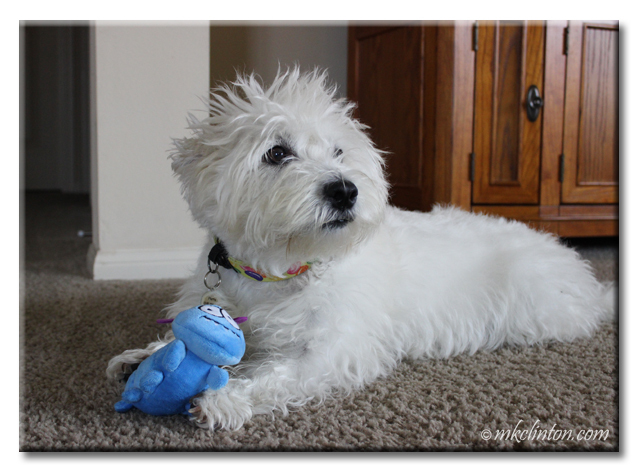 Pierre Westie: “Let me just say that I LOVE, LOVE, LOVE goDog® toys. They are some of our favorites and Mom is not afraid to play tug super hard with them. I don’t think I’ve been able to kill one yet. This is our newest plush squeaky toy, The Caterpillar. I can’t wait to get a hold of him. Look at his eyes and tiny fangs. This fella is going to put up a good fight. We received our goDog toy as influencers with Propel Communications in exchange for an honest review. We only share products that believe our readers would benefit from knowing about. GoDog and Propel Communications are not responsible for the contents of this article. Drat! This one is made with Chew Guard Technology™ and has a super tough and durable lining. This may take some work. What do you mean to be easy? Do I look like I'd try to harm one purple felt ear on this adorable little squeaking bug? Your lack of faith is disheartening, Mom. Just sayin'. Ha! She knows that I am going to try my best to dead this caterpillar. Its bright colors and funny face are endearing though. Perhaps, I'll let him live so we can play catch with him. He is the perfect size for a Westie's mouth. Do you hear that, Bentley?" 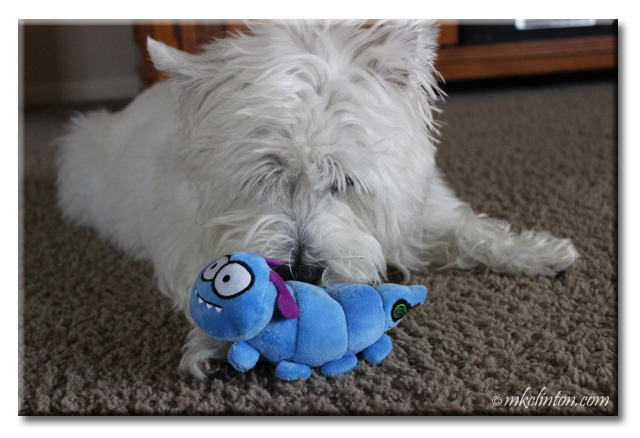 Mr. Blue Caterpillar will be mine! It fits your mouth but it is fine for mine too. No hurry, I'm an expert at waiting. In the meantime, let me tell our friends that they can find goDog toys on our Amazon Influencer page. We highly recommend their entire line including the Fuzzball." Pierre: "Y'all should also follow them on Facebook, Twitter, and Instagram. They have fabulous giveaways every week! GoDog is tough for fun!" He is still okay but Pierre is apt to get a wild hair and attempt to destuff the little fellow. Oooh! We will have to try! The boys love it because it fits perfectly in their mouths. He is adorable! I like that pink/purple one for us girls, but we probably wouldn't play with it enough to need to get one. Enjoy! We love all of their toys. 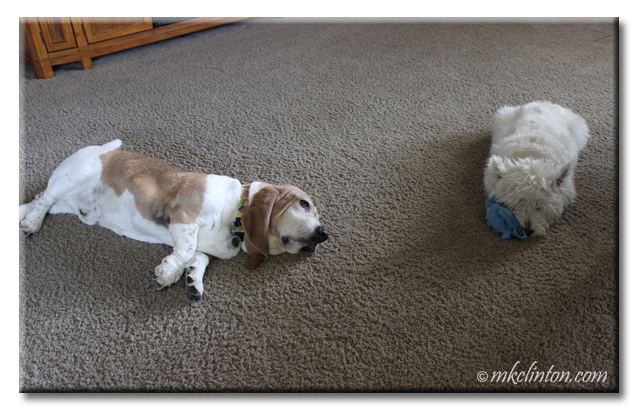 We play pretty hard with our toys though so we need lots of them! LOL! 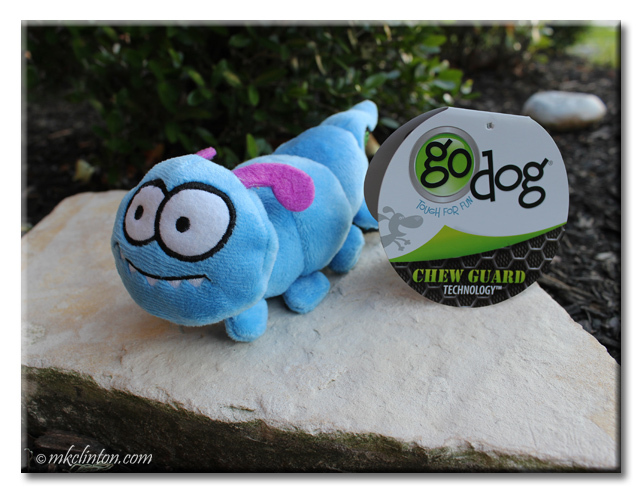 goDog have some of the cutest faces for their critters. That's a cute toy, enjoy guys. I haven't met a squeaky toy yet that I couldn't destroy, even the so-called indestructible ones. Bring it on! We are sad to report that Pierre has sent our Lampchop to Mom's sewing kit a few minutes ago. Pierre took out his squeaker and amputated the foot. It is a tragedy. BOL! BOL! Pierre you might wanna guard that adorable stuffy I'm purrty sure your little human would love it too. The little human is so funny with our toys. She will hand them to Mom so she can throw them to us. We saw her sitting in my new cushy dog bed the other day! Thanks! Pierre is absolutely the happiest dog that I've ever known. He smiles so big. That caterpillar is too cute to play with! That is what Mom said but we were able to talk her into giving it up for the good of the review. BOL! We have 2 furballz and they are still hanging in there. Mackie loves them when he comes to visit us. The caterpillar is cute and I like his size! We have the regular and giant Furballz and LOVE them both. The entire line of goDog toys are fun. I'm proud to say that the ears are still there! They have played hard with him but he has stood up to the fight. 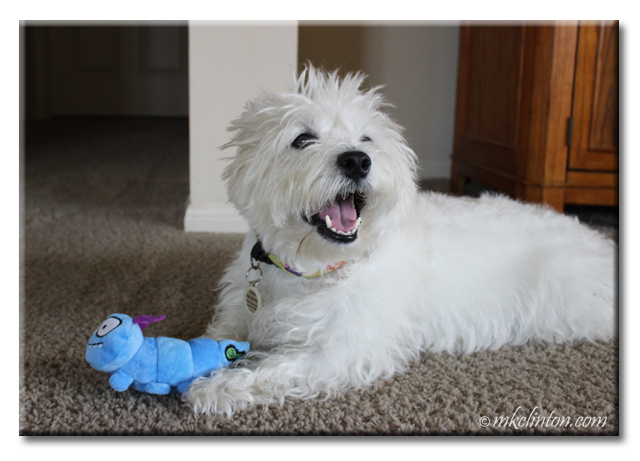 Thanks so much for the visit over at Wag n' Woof for my guest post! Oh!! I want my own caterpillar!!! OMD! These would be the perfect Pug size too!